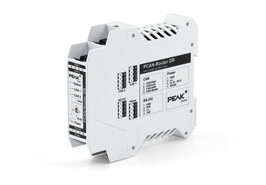 The PCAN-Router DR has two High-speed CAN channels. Their bit rate is adjusted with a rotary switch on the device front. The module forwards the message traffic bi-directionally 1:1 between both connected CAN busses.